14 Settembre 2017 – W.A.P. Kirvanveggen Camp is listed on our WAP-WADA Directory and it was activated by Radio amateur (Callsign 7S8AAA) in the 90ties. We did involved the Polarforskningssekretariatet in Sweden, to know if they could have archived some more information. The answer from Ida Edlund, Registrator, Administrativ handläggare/Registry Clerk, Administration Officer at Polarforskningssekretariatet/Swedish Polar Research Secretariat, P.O. Box 50003, SE-104 05 Stockholm, Sweden (ida.edlund@polar.se – www.polar.se ) was prompt and kind: -We believe that what you are referring to may be a temporary camp from a project in the 1990’s. However there is no Swedish camp there anymore and we unfortunately do not have any more information about this-. 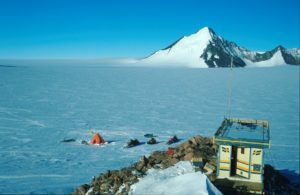 Swedish Antarctic Research Program (SWEDARP) was assigned the call 7S8AAA, and early in 1988 a group of 12 geology researchers spent a few months in the Antarctic. 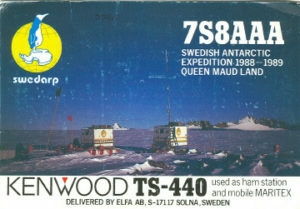 Kent SM7DSE, a University of Lund professor, was the one who made amateur radio a part of the expedition. He planned to work CW, SSB. RTTY, AMTOR, and HF Packet. QSL cards was requested to be sent via SK0MT, Club Taby Sandaramatorer. Looks like that, Swedish Kirvanveggen Camp – Antarctica was set close to the site where the Swedish SVEA Base, was built during the 1987/88 expedition. Once again Ida Edlund wrote: -After your previous mail with the picture, we started to look at the research expeditions from the late 1980’s (instead of the 1990’s) and found that Kent Larsson, of the University of Lund, was one of the participants in the 1988/89 expedition at Vestfjella and Heimefrontfjella, close to Kirvanveggen. Kent is a radio amateur and now I see that you already have that information. Kent Larsson is still affiliated with Lund University as Professor emeritus. Stay tuned and follow us. WAP is always on the front line of the Antarctic matters. Svea is located in the Scharffenbergbotnen valley in the Heimefrontfjella mountain range, about 400 km from the coast. It was built during the 1987/88 Antarctic expedition and was the first Swedish research station in Antarctica since the Snow Hill station in 1901 and Maudheim in 1949. Svea is a satellite station to Wasa and is an excellent base for small, transient research teams performing fieldwork in the area. The station, comprising two joined fibreglass modules, is about 12 m2 and has four beds and one pantry. The station is currently the home base for two permanent monitoring projects: continual geodetic measurement using GPS technology, run by the Royal Institute of Technology in Stockholm, and a seismograph that records movements in the earth’s crust, run by the German Alfred Wegener Institute.